Russell was born into her musical family on April 27, 1931, in Campti, Louisiana. 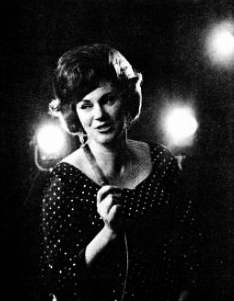 She performed with siblings Jim Ed and Bonnie Brown as The Browns. The siblings’ first chart single, “Here Today and Gone Tomorrow,” peaked at No. 7 in 1955, and in 1956, their recording of “I Take the Chance” hit No. 2 on the country charts. However, The Browns were most known for their sweet harmonies on “The Three Bells,” which was released in 1959. The Browns continued to find crossover success with songs including “The Old Lamplighter” and “Scarlet Ribbons.” Russell’s first success as a songwriter came with The Browns’ release of “Looking Back To See.” In 1963, The Browns were invited to join the Grand Ole Opry. After more than a decade as a trio, the Browns stopped recording together in 1967, but her artistic endeavors didn’t end. In 2012, Russell was awarded the Ella Dicky Literary Award for her 2005 autobiography “Looking Back To See.” The Browns were inducted into The Arkansas Entertainers Hall of Fame, The Arkansas Walkway of Stars, The Missouri Walkway of Stars and are a recipient of a Lifetime Achievement Award from The Arkansas Country Music Hall of Fame. By Joe Nerssessian | The Zombies bassist Jim Rodford has died aged 76 just days after his final performance. The musician, whose career spanned six decades and included 18 years with The Kinks, died on Saturday after a fall on the stairs, his cousin and the band’s frontman Rod Argent confirmed. Rodford had just returned home to England after completing a short tour in Florida with The Zombies with his final on-stage appearance coming on 14 January. Argent paid tribute to his “dear cousin and lifelong friend”, writing on the band’s Facebook page: “It is with deep sadness that I learned this morning that my dear cousin and lifelong friend, Jim Rodford, died this morning after a fall on the stairs. Argent said Rodford was dedicated to music “to the end” and added he “was unfailingly committed to local music”. “Often, Colin (Blunstone) and I would compare notes a couple of days immediately after a US tour and discuss how long it would take us to recover from an intense, fantastic but exhausting couple of months – only to find out and marvel that Jim had already been out playing with local bands,” he wrote. Rodford had been working on his autobiography at the time of his death and is survived by his wife of 56 years, Jean and three generations of Rodfords. The Kinks’ official Twitter page said he would be “greatly missed”. Walter James “Jim” Rodford was born 7 July 1941 and began playing bass in the late Fifties with St Albans’ skiffle band The Bluetones. He helped Argent form The Zombies in 1961, declining an invitation to join the group but coached them through their first rehearsals. Following the break-up of The Zombies in 1968, he joined Argent’s new band – the eponymously named Argent – with gold records and chart success following as they released “Hold Your Head Up” and “God Gave Rock & Roll To You”. When Argent split in 1976 Rodford joined The Kinks during their later years and remained until their dissolution in 1996 when he came full circle by eventually joining The Zombies – along with his son Steve on drums – as they were resurrected by Argent and Colin Blunstone in 1999. He spent the next 18 years recording and touring with The Zombies until his last performance six days ago at the 30A Songwriters Festival in Miramar Beach, Florida. In September last year, Rodford received an honorary Doctor of Arts degree at the University of Hertfordshire. 23: Oliver Mtukudzi, 66, Zimbabwean musician; Ryszard Peryt, 71, Polish conductor and librettist. 22: Ahmed Imtiaz Bulbul, 63, Bangladeshi musician and political activist, heart attack; Roman Kolakowski, 61, Polish composer, poet and musician. 21: Marcel Azzola, 91, French accordionist (Jacques Brel); Kaye Ballard, 93, American actress (The Mothers-in-Law, The Doris Day Show) and singer (“Fly Me to the Moon”), kidney cancer; Edwin Birdsong, 77, American funk keyboardist; Maxine Brown, 87, American country singer (The Browns), complications of heart and kidney disease; Ulises Butrón, 56, Argentine rock guitarist and singer, complications from pneumonia. 19: Mario Bertoncini, 86, Italian composer, pianist, and music educator; Ted McKenna, 68, Scottish drummer (The Sensational Alex Harvey Band), haemorrhage during hernia surgery. 18: Marcelo Yuka, 53, Brazilian drummer and songwriter (O Rappa), stroke. 17: S. Balakrishnan, 69, Indian film score composer and music director; Debi Martini, American punk rock singer and bassist (Red Aunts); Tara Simmons, 34, Australian musician, breast cancer; Reggie Young, 82, American musician (The Memphis Boys). 16: Jean Chatillon, 81, Canadian composer; Lorna Doom, 61, American punk rock bassist (Germs); Alfred Kunz, 89, German-Canadian composer and conductor, heart disease; Ilgam Shakirov [ru], 83, Russian singer; Brian Velasco, 41, Filipino drummer (Razorback), suicide by jumping; Rita Vidaurri, 94, American singer; Chris Wilson, 62, Australian musician (Short Cool Ones), pancreatic cancer.